Mistra EviEM | SR3 Can biomanipulation improve water quality in eutrophicated lakes? SR3 Can biomanipulation improve water quality in eutrophicated lakes? Fishing in Lake Finjasjön. Photo: Johan Forssblad. Reducing the populations of roach and bream in a eutrophicated lake can be a way of curbing algal blooms and similar problems. The method has been tried in many parts of the world, often with good results. EviEM has now assessed how useful it is. Over the past century, thousands of Swedish lakes have suffered from eutrophication (over-enrichment with nutrients) as a result of sewage discharges from urban areas or nutrient run-off from land. These nutrient inputs have now been reduced, but in many cases the problems of algal blooms, oxygen depletion etc. remain. An important reason for this is that phosphorus that has accumulated in the benthic sediments of eutrophic lakes can leak into the water, keeping it nutrient-rich for decades. In certain cases where recovery has failed to materialise, remedial action has been attempted in the lake itself. One option is biomanipulation, i.e. removal or stocking of fish or other species. 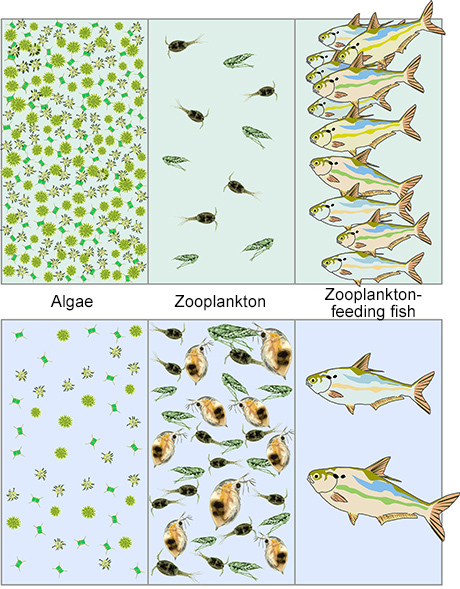 In most cases, biomanipulation involves intensive fishing intended to reduce the stocks of zooplankton-feeding or bottom-feeding fish. In European lakes, this category of fish is dominated by roach, bream and other cyprinids. A reduction of the populations of such fish may induce ecosystem changes that increase water transparency and decrease the risk of algal blooms and oxygen deficiency, at least in the short term. If stocks of zooplankton-feeding fish are reduced in a lake, zooplankton stand a better chance of surviving. This in turn may decrease the amounts of planktonic algae on which the zooplankton feed. Image: Anthony Thorpe, Lakes of Missouri Volunteer Program. EviEM has now conducted a systematic review of how biomanipulation affects water quality in eutrophic lakes. The review project started in December 2012 and was led by Per Larsson, professor of aquatic ecology at Linnaeus University in Kalmar. After an extensive literature search, the review team embarked on detailed appraisal of more than 200 scientific studies found to be relevant to the subject of the project. Altogether, these studies reported useful data on 128 restoration projects in 123 different lakes. Of these interventions, 85% had been made in Central or Northern Europe and 15% in North America. EviEM:s review shows that a clear majority of the biomanipulations studied had positive effects on water quality. The water transparency (measured as Secchi depth) had in most cases increased, whereas the amounts of planktonic algae (measured as chlorophyll levels in the water) had in most cases decreased. These effects usually appeared not only during biomanipulation but also at least three years afterwards. However, we found that such improvements cannot be expected unless active fishing is carried out. An alternative technique is to stock lakes with pike, perch or similar predatory fish in order to have them reduce the populations of cyprinids, but this usually fails to produce the desired effects on water transparency and algal amounts. 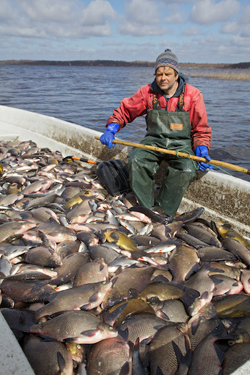 Bream caught in Lake Finjasjön. Photo: Johan Forssblad. • Biomanipulation tended to be particularly successful in relatively small lakes with short retention times and high pre-manipulation phosphorus levels. • More thorough fish removal increased the efficacy of biomanipulation. • For chlorophyll, these two relationships also tended to reinforce each other – increasing the fish removals had the strongest effect in lakes that were small and/or had high pre-manipulation phosphorus levels. To summarise, our results indicate that removal of plankton-and bottom-feeding fish is a useful means of improving water quality in eutrophic lakes. In Sweden, only a handful of lakes have so far been treated in this way, notably Ringsjön and Finjasjön in Skåne and Vallentunasjön north of Stockholm. With the introduction of the EU’s Water Framework Directive, requirements in terms of action to tackle eutrophication have been stepped up, however, and Swedish authorities have recently expressed increased interest in biomanipulation as a means of restoring nutrient-rich lakes. A final report on EviEM’s biomanipulation review was published on May 22, 2015. Results have also been published in a popular summary and a fact sheet (see links at right). The review team at a meeting in December 2013. 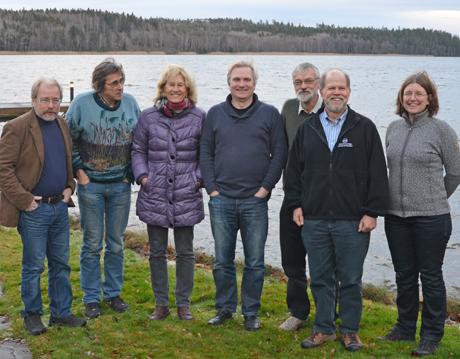 From left to right: Per Larsson, Lennart Persson, Ellen Van Donk, Christian Skov, Claes Bernes, Steve Carpenter and Anna Gårdmark. Photo: Matilda Miljand.